The Sechin Complex: (Casma Valley Complex). 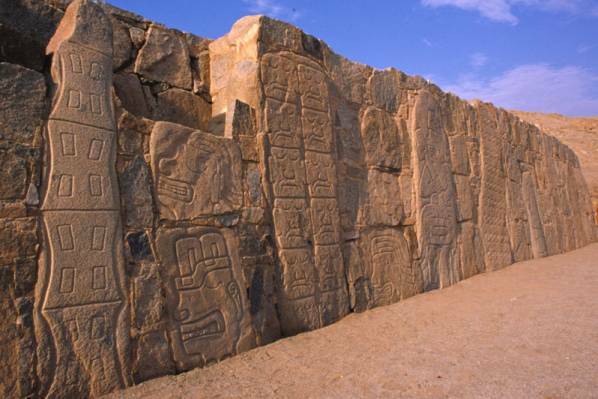 The archaeological site called Sechin Alto is home to the largest pre-Columbian monument in Peru. 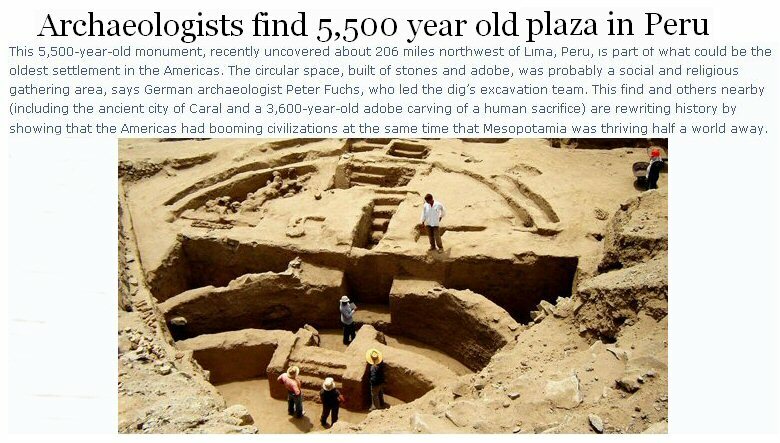 The Sechin complex in the Casma Valley was the capital of a pre-Incan culture located on the northwest coast of Peru, occupied between approximately 1,800-900 BC. The significance of these early dates means that it preceded the much better known site of Chavin de Huantar by nearly a thousand years rather than visa versa as had been thought previously. The site is remarkable for its enormous mound, the largest of its time period, measuring some 990 feet long, by 825 feet wide by 145 feet tall. The mound was faced with granite blocks, some weighing over 2 tons. Sechin Alto's great size may represent a 1000 year building span. The Sechin Complex was a vast proto-urban settlement several miles in diameter, centred on the large mound of Sechin Alto. It included the sites of Sechin Bajo, Taukachi-Konkan, and Cerro Sechin. Sechin Alto is located on the left margin of the Sechin River, along the road to Huaraz. This temple site is the largest of the Pre-Columbian monuments of Peru, and is the largest of the Casma Valley structures. It was constructed from dressed stone and "conical" style adobe, with a U-shaped monument plan covering about 200 hectares. Five plazas extend about a mile (1.4 km) from the huge central mound, three with central sunken courts, one of which is about 250 ft (80 meters) in diameter. The main mound is 44 meters high by 300 meters by 250 meters., making it the largest single construction in the New World during the second millennium B.C. 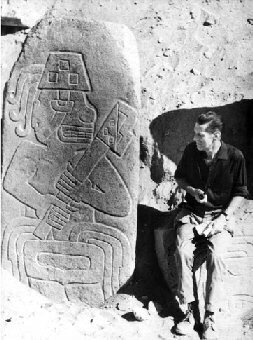 New ruins found at Sechin Bajo. Slighty northwest of the site of Sechin Alto, and clearly visible from the top of its main mound. Although the clusters of mounds and plazas on either edge of the plain were formerly treated as separate sites (Thompson 1961: 211-217), an examination of air photographs revealed a set of connected and associated architectural features. The total complex covers an area of about 1250m by 500m. As at Sechin Alto, most of the structures are constructed of granite blocks quarried from nearby hillsides; all of the blocks were laid in a silty clay mortar. The constructions were also orientated along an axis of E32 N.
Inhabited for much of the second millennium B.C., Cerro Sechin has been the most intensively studied site in the Sechin Complex. 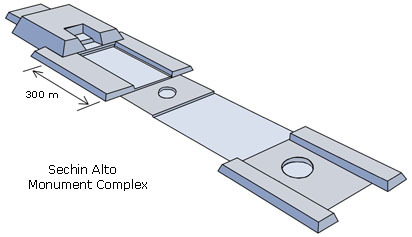 It covers roughly 50,000 meters squared and consists of a quadrangular three-tiered stepped platform flanked on each side by two smaller buildings. The platform was constructed in several stages using conical adobes, or large sun-dried bricks with broad circular bases and tapered points, which were then set into clay mortar and plastered over to form wall surfaces. The retaining wall, roughly 4.15 meters (13.5 feet) tall and containing nearly 400 granite sculptures, was added relatively late in the site's history and encircled the perimeter of the building. The stone sculptures, undoubtedly the most famous feature at Cerro Sechin, depict a possible mythological or historical scene in which a procession of armed men, probably important personages or warriors, make their way among the mutilated remains of human victims. Given the gruesome nature of the stone frieze, it seems likely that some degree of warfare, violence, and/or raiding existed among these early valley peoples. Though little is known about Cerro Sechin's demise, the site appears to have been abandoned by 800 B.C., paralleling the decline of other important ceremonial and public centres on the Peruvian coast at this time. The Sechin Valley is also home to the enigmatic, 2,300-year-old ruin named the 'Chankillo'. Archaeologists have nicknamed the ruin’s central complex the “Norelco ruin” based on its resemblance to a modern electric shaver. The building’s true purpose long eluded them. Its thick walls and hilltop location suggested it was a fort, but why, researchers wondered for a long time, would anybody build a fort with so many gates and without a water source? 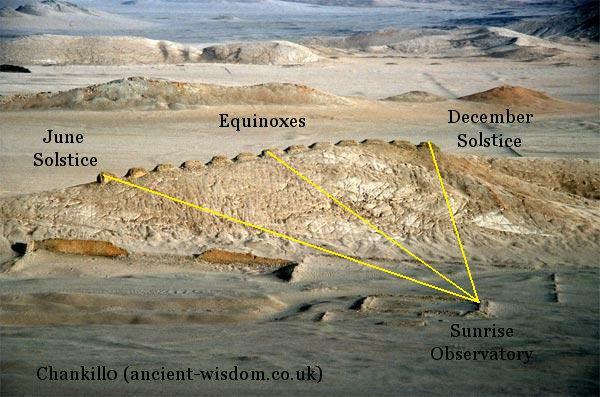 The Thirteen Towers on a nearby ridge were the key to the scientists conclusion that the site was a solar observatory. The gaps between the towers are wide enough for just one or two sunrises to be observed in each. The regularity of the gaps suggests that the year was divided into regular intervals. 2). S. Pozorski, T. Pozorski. Early Settlement and Subsidence in the Casma Valley, Peru. 1987. University of Iowa Press.